Now that I'm more or less settled into Seattle, I can actually catch up a bit! I had one book out last week, and one comes out today. First up, today's release: the first book in the new multi-author Bluewater Bay series, STARSTRUCK, available from Riptide Publishing. Available on Amazon, AllRomance, and Barnes & Noble. Remaining just friends is the only thing to do, as both the studio and Levi’s disapproving, dysfunctional family remind them daily. Except their friendship deepens by the day, tempting them with what they can’t have but both desperately need. 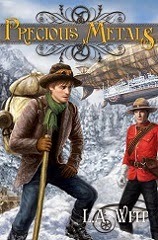 And last week's release, also from Riptide Publishing, is PRECIOUS METALS, a steampunk story set in the Klondike Gold Rush like Noble Metals. It's available on Amazon, Barnes & Noble, and AllRomance. For Constable Paul Benson of the North-West Mounted Police, monotony is a blessing. As a provision inspector below the Chilkoot Pass during the Klondike Gold Rush, he’s seen miserable conditions and gold fever turn civilized prospectors into madmen. Joseph Starling is on his way to the Klondike to find the men who savagely beat him, murdered his eldest brother, and stole their mining machine. They’ll kill his youngest brother if Joseph doesn’t operate the machine for them—it won’t work without him. With time running out, Joseph must purchase an expensive ticket aboard a crash-prone airship. But the station is miles away through dangerous terrain. Under orders, Paul grudgingly escorts Joseph, but quickly finds himself intrigued by the young man. As they make their way toward Juneau, it’s not just the need for warmth that drives them closer together. But neither man can draw an easy breath until they make it to the gold fields . . . and there’s no guarantee that Joseph’s brother will still be alive when they do.